For all of his short adult life, Alexander Scriabin wrote - or planned to write - monumental works of great import, and in between these efforts he produced a steady torrent of miniatures, tiny concentrated droplets of this same expansive genius. Fascinatingly, the composer�s designation �po�me� is applied both to ground-breaking symphonic perorations and to the extended series of thirty-four little piano pieces, written over more than a decade and often grouped into little sets. Their inspirations are as varied as their titles - from black magic to cosmic aspiration - and they offer a key into their composer�s inner world. American pianist Garrick Ohlsson is an acknowledged master of the genre - astonished critical reaction to his recordings of Brahms, Granados and of course Chopin attest to this, and this new Scriabin recording will only enhance an admirable reputation. 2015 marks the centenary of the death of Alexander Scriabin, one of the most individual voices in early twentieth-century music. He was active as a composer from the mid-1880s until his early death at the age of just forty-three, and his music is a heady mix of post-Wagnerian late Romanticism and early modernism. Precociously self-assured, Scriabin embarked on a series of increasingly grandiose orchestral projects, which was to have culminated with the unrealised multi-media Mysterium for visual and performance arts, suffused with a sense of his own Messianic destiny. The other side of his musical creativity is represented by the piano sonatas and miniatures, concentrated in medium and scale, yet every bit as bold and transcendent as his symphonic works. The Hyperion label has served Scriabin's music particularly well. For the centenary celebrations they have not only re-released Piers Lane's acclaimed accounts of the complete �tudes and Pr�ludes on their budget-price Helios imprint, but now add a brand-new recording of the complete Po�mes by American pianist Garrick Ohlsson. Ohlsson's mastery of small pianistic forms in the works of Chopin and Brahms makes him ideally qualified to undertake such a venture, and the result is a real treasure. These thirty-four works are miniature counterparts to Scriabin's large-scale orchestral po�mes: the Divine Poem, Poem of Ecstasy and Prometheus: Poem of Fire. Far from being shavings from the compositional workbench, however, they each represent a self-contained and mystical soundworld, from the reflective and sensual to the outright demonic (as in the Po�me satanique, track 4). In their rich yet evanescent harmonies, they rather resemble shavings of truffle. Most of them are little more than two minutes in length, with the wonderfully epigrammatic Po�me fantasque (track 9) coming in at a mere thirty seconds! Ohlsson's recording gathers all of the piano works designated po�me as well as several related miniatures to give a generous eighty minutes of playing time. By ordering the works chronologically, he allows the listener to follow the astonishing development of Scriabin's musical style, from the late-Romantic world of the Deux po�mes, Op.32 (1903), to the elusive harmonic language of the Deux danses, Op.73 (1914), his penultimate opus. 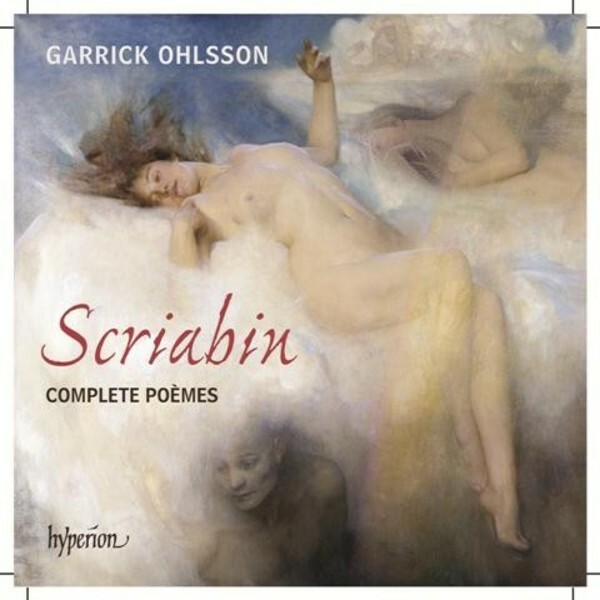 Ohlsson brings to these performances a clarity and level-headedness that perfectly complements the intoxicating power of Scriabin's music, and his exceptionally wide reach means that none of the technical demands are beyond his capability. The presentation and recording (made in London's Henry Wood Hall) are well up to Hyperion's usual high standards, and lovers of piano music everywhere will once more be in their debt for a superb addition to the catalogue.